Washington, D.C. (TADIAS) – Over 700 people packed the historic Howard Theatre in Washington, D.C. last Monday (September 30th) to participate in the Mayor’s 2013 Annual DC African Heritage Cerebration. The colorful stage event, hosted by the Office on African Affairs in partnership with the DC Commission on Arts & Humanities, included the worldwide observance of the 50th anniversary of the OAU as well as an awards ceremony highlighting the unique contributions of members of the vibrant African community to DC’s economic and social life. Among the individuals recognized by Mayor Vincent C. Gray included Angelle Kwemo in Public Service, Tereguebode Goungou in Community Organizing, Tamrat Medhin in Panafrican Bridge Building, Anthony Chuukwu in Institution Building, and Henok Tesfaye in Business. 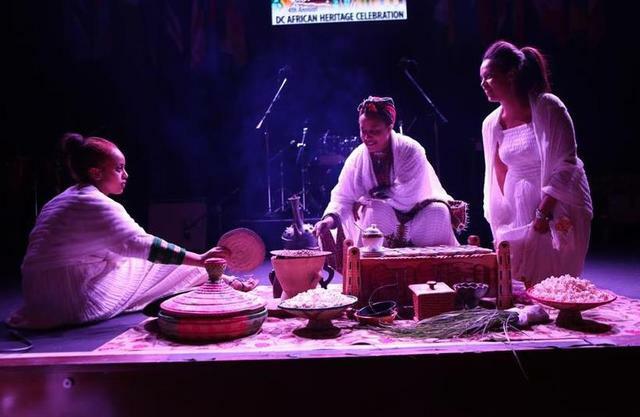 The entertainment segment of the event, which kicked off with an exhilarating performance by the West African Dance Ensemble Balafone, also included a surprise closing appearance by the Ethiopian rock group Jano Band before they headed back to Ethiopia. Below are photos from the event courtesy Matt Andrea.